During my lifetime Harman Kardon has always been a trusted name in audio. If you heard the name Harmon Kardon you knew it was a quality piece of audio equipment. In the 1950s Harman Kardon was one of the first companies to introduce high fidelity audio products that brought good quality audio to the average consumer and started the high fidelity business we now have today. Harman Kardon’s philosophy from the very beginning was to introduce non-technical consumers to high fidelity. They were the first to combine many now-familiar features such as a tuner, component control unit and amplifier in one single unit. The Harmon Kardon Go+Play is a great little speaker for it's size. It is not overly flashy with a classic speaker look and has limited bells and whistle as compared to other brands on the market. But this speaker for its size, portability, expansive sound and rich bass are hard to beat and with the new lowered price, It goes on sale often, makes the Harman Kardon Go+Play a real steal. Let's look further with my Harman Kardon Go+Play Bluetooth Speaker Review. Times have changed in the audio world. 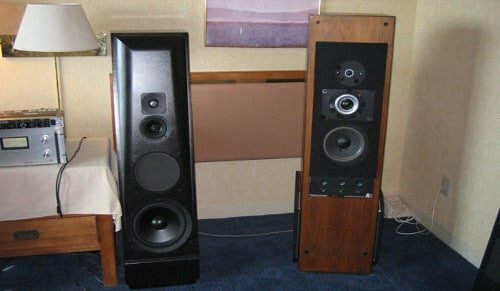 Young people are not purchasing big stereo setups with a pair of huge speakers and a powerful amplifier. Also eliminated from most listener's home today, is the big pile of LPs, cassettes or CDs. These have been replaced by smart devices as the audio source of the day that connects wirelessly using Bluetooth technology. Harmon Kardon over the years has changed with the times and has expanded the usability of their speakers, in particular, portable Bluetooth portable speakers. 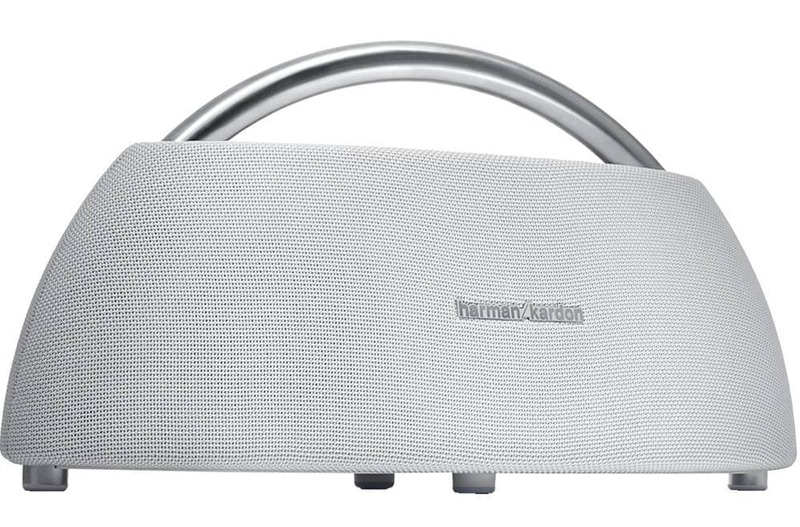 The first Harman Kardon Go+Play Wireless speaker was introduced in 2013. It had two speakers in the front with a glossy finish. The Go+Play Wireless required eight type-D alkaline batteries and play time varied depending on the quality of the batteries you purchased. When plugged in, the system uses AC power and preserves the batteries. There are no recharging capabilities on the older Go+Play Wireless. The new Harman Kardon Go+ Play is a much-improved version of the older model. It has a nice classy cloth finish available in black or white with a nice brush metal handle for a classic audiophile look. It has improved balanced sound compared to it predecessor and now has an onboard 22.2Wh rechargeable battery that allows up to 8 hrs of playtime. No need to purchase batteries. The playback sound quality is also more consistent when plugged in or using battery power unlike the first version of the Go+Play Wireless that varied with volume and overall sound quality using different power sources. The new Go+Play does not get as loud as the old version Go+Play Wireless when plugged in. The overall sound of the new Go+Play is more consistent, less processed and clearer plugged in or using battery power. So let's have a closer look with my Harman Kardon Go+Play Bluetooth speaker review. The new version of the Harman Kardon Go+Play released in 2016 is similar in shape than its previous model but that is where the similarities end. In one word the new model, Harman Kardon Go+Play is "mature". The new Go+ Play is slightly smaller and finished with two removable speaker grills available in black or white revealing two 90 mm woofers and two 20 mm tweeters. On the front and back of the speaker is a passive radiator. This is the secret to its great low-end sound. Two 90 mm woofers and two 20 mm tweeters. Front passive radiator front and center. Back passive radiator. This is the secret to the great bass sound. A simple clean modern design with a rubber surface on the top with just five basic control buttons that perform all the speaker's functions and five LED lights to indicate battery life. Crowning it off is a brush metal handle to easily carry the speaker's seven and a half pounds around the house. The base is made of plastic with for little rubber tipped legs, two finished in metal completing the flow of the metal handle. The build quality is top-notch, as expected from Harman Kardon products. The Go+ Play has a little weight and size. Although not small it is an ideal speaker size for listening to music around the house. This speaker is great for in the backyard for a tanning session or a dip in the pool with friends. It is built very well and can take a little splash but this is not a waterproof speaker. You can put it on the lawn but in general, I would keep the speaker on a solid surface and keep moisture away. This design really reminds me of the classic art deco look. I feel it is a retro-modern look that never goes out of style. This style always features clean simplest lines without a lot of flash. It really has a classic audiophile look that can add a little sophistication to your deco as compared to many other wireless more juvenile looking speakers on the market. 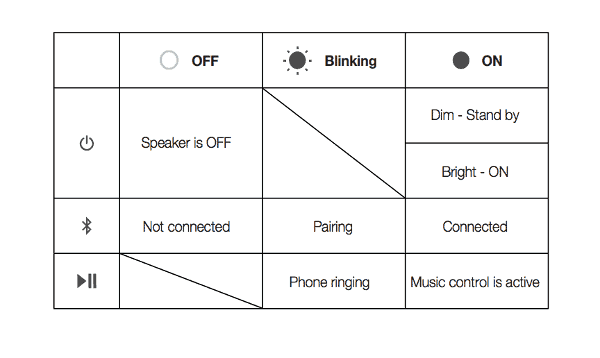 Functions on the Harmon Kardon Go+Play are pretty straightforward. 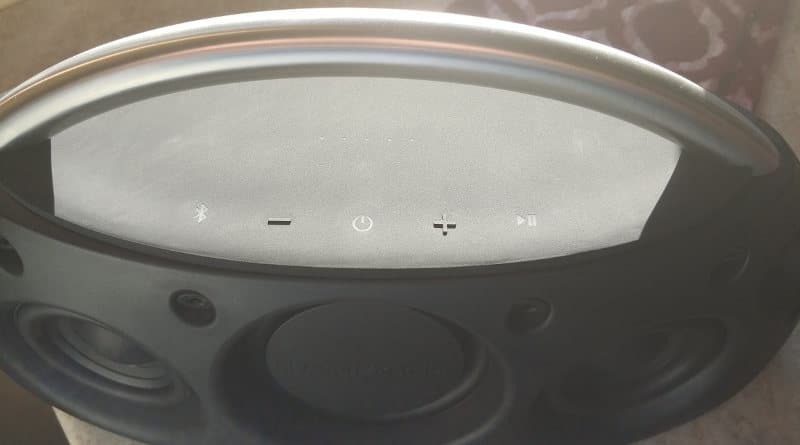 All controls and battery indicator is located on top of the speaker. First button is the Bluetooth pairing button. Last button is the forward and speaker phone. For taking calls hands free. Located on the back near the bottom is a compartment with one USB charge out port, a micro USB service port and a 3.5 MM audio input for direct input for wired sources. Finally, a power connect-input to charge up the Go+Play wireless speaker. For easy reading here is the PDF manual for the Harman Kardon Go+Play. 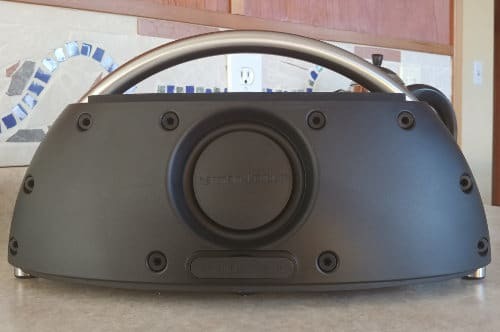 This speaker has four speakers on the front and an additional passive radiator woofer on the front and back that makes this speaker emit sound more unidirectional. Although directly listening from the back dramatically reduces the high-end sounds. The extra radiator on the back really adds to the overall warm rich base that is produced at any volume. It fills the room with a clean sound that is not overly processed more like the sound of a high fidelity stereo and not ​what you would expect from a relatively compact speaker. With Go+play you can stream music wirelessly via Bluetooth . Connect up to 2 smart devices at the same time so you can take turns playing music. After initially syncing with a smart device it will automatically search and find device in future sessions. The Harmon Kardon Go+Play now has an onboard a 22.2 Wh rechargeable battery that will give you up to 8 hours of play time and it only takes about 3 hours to fully charge. You can make clear conference calls with Harman noise and echo canceling technology. Connecting two Go+Play speakers also really works great. You will get true Hifi stereo sound that can be really utilized at a party or more serious listening session. If you have two Go+Play speakers press the Bluetooth pairing button on both units for 5 seconds. You will hear the speaker make its familiar pairing sound. The speakers will now perform like a pair of stereo speakers. Classic speaker fabric finishing, stainless steel handle, and clean controls add style to any decor at home or on the go. The Harman Kardon Bluetooth speaker is available in two colors classic black and white. If you are going to take it on the road or if you have young children, I think black is your best bet to avoid a dirty looking speaker. But if you plan to keep it in your bedroom and not stray too far and if it fits your preference, the white version will work well and look really cool. Now the important part, we have established the fit and finish of the Go+ Play is outstanding but now how does it sound? The overall sound is incredible, rich, warm and very expansive for such a small speaker. The bass you can feel, even at lower volume. The low end comes through nicely but at times can be a little too much. Vocals are pushed slightly forward and come through very clear. The highs are crisp but not excessive and the mids are slightly set back in the mix. At top volume, there is no distortion. 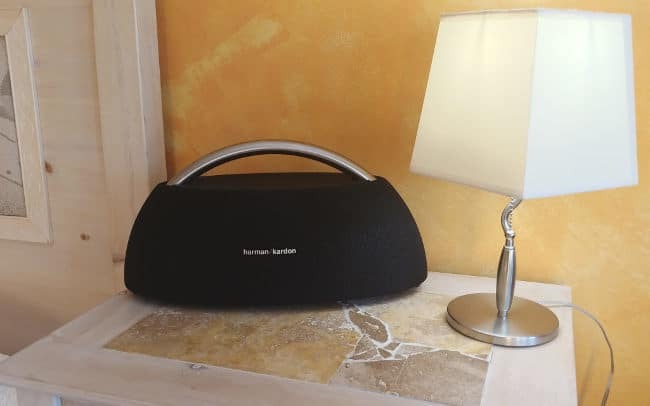 The Harman Kardon Go+Play is not as loud as some similar speakers on the market but the sound is a much more sophisticated Hifi sound with a very even sound signature , but still plenty loud to upset the neighbours. The bass is very impressive with the Go+Play speaker. It's always very present so much that you can feel it. The sound is very warm and full at low and high volume. The bass has an expansive sound that fills the room. The bass sounds great with older recordings but the Go+Play really comes to life with newer pop songs with a big resonating bass. The bass can be a bit much at times and an alternate mode or a Eq App would be a nice addition to tone the bass down. The midrange is clear and pushed slightly forward. Vocals always come through very clearly. At lower volume, the vocals and bass are very present and the other instruments are pushed back in the mix. The high end is clear with no distortion. It is not overly crisp and overly processed like many other similar speakers available. This speaker is a great sounding speaker that is ideally suited for someone that listens to music mostly at moderate levels and from time to time turns it up loud. The sound is very rich with a fairly even sound spectrum and a warm bass. Older classics sound good but newer modern pop recordings also shine through nicely with the Harman Kardon Go+Play. 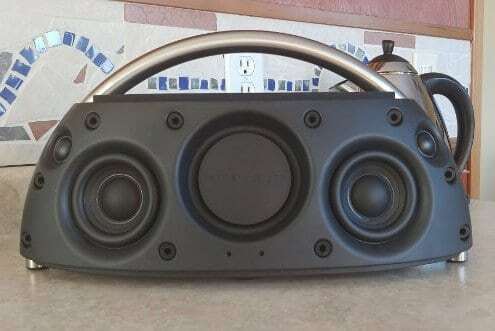 This speaker would be great for a kitchen speaker or at the office. You can easily move it around the house or out to the backyard. It has only 8 hours of playtime, lower than many other wireless speakers on the market. But I think the ideal user will not stray too far from home and battery life will not be a major issue. You may even keep it plugged in sitting on a shelf permanently and only occasionally unplug it and move it to the backyard for a little get together. The Harman Kardon Go+Play does not have wifi capabilities thereby making it incompatible with smart home systems that are becoming more popular. It also has a limited amount of features compared to some newer models on the market. Pricing on the Harman Kardon Go+Play is MSP $399 but I have seen them on sale for as low as $200 making them at that price an incredible deal if you compare it with other speakers in this price range and class..
With the reduced price buying, two Go+Play will give you a real portable Hifi stereo sound system. Have the two speakers in different rooms for everyday use and at family get-togethers bring them out by the pool or in the same room, then sync them up for a full portable stereo system that is sure to entertain. "The Harman Kardon Go+Play is a great speaker for a mature adult but if you have a young family I think a better option would be the JBL BoomBox at ​$50 more than the Go+Play. The Boombox has louder volume with big expansive sound, it is completely waterproof, much more rugged and if someone touches the Boombox with the messy hand it can literally be hosed off. See my full JBL Boombox Review. I compare the two speakers in my JBL Boombox Vs Harman Kardon Go+Play post. The Harman Kardon Go+Play has a retro feel in more ways than one. The look is classic audiophile, and the sound quality of this speaker is as well. It is reminiscent of an older hi-fi stereo, the sound is not overhyped and over processed unlike what many younger speaker companies are producing. With the vast variety of music and quality of playback records, at times the bass is a little too much and a simple Eq App, would be really nice to make a little adjustment. The simplicity is what makes this speaker really nice and goes along with the art deco concept. A few buttons to press and you're listening to music. Many people don't need or use extra bells and whistles and that is also the appeal of the Go+Play speaker. What Harman Kardon shows with the Go+Play Bluetooth speaker is they still are a force to be reckoned with when it comes to quality audio equipment. They're always changing with the times and still maintaining their original philosophy "to bring quality audio to the average consumer". I think they accomplished that with the Go+Play Bluetooth speaker.